In all the time he had spent thinking about his escape since arriving in Pretoria, the one scenario that Churchill had not envisioned was crossing enemy territory alone without companions or provisions of any kind….Beyond the vaguest of outlines, he didn't even have a plan—just the unshakeable conviction that he was destined for greatness. Before becoming prime minister of England, Winston Churchill sought fame and glory on the battlefield. But it was not until he joined the frontlines of South Africa's Boer War as a journalist—and was imprisoned by the Boer rebels—that he achieved the notoriety that would jump-start his political career. 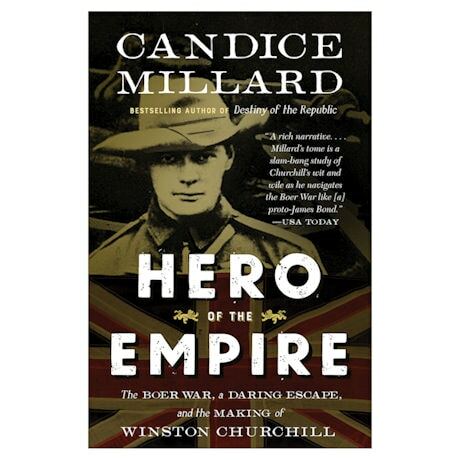 Historian Candice Millard offers an epic chronicle of Churchill's capture, time as a prisoner, and daring escape from a POW camp in Pretoria. At once a thrilling adventure story and an insightful historical study, Hero of the Empire brings to fascinating life this pivotal period in the life of the great statesman.